Minnesota is Ford Truck country, plain and simple. The state experiences all four seasons in full force, especially the brutally cold and snowy conditions unleashed on us each winter. Owning a pickup truck around here just makes sense. A pickup truck has the kind of height and stance needed to navigate the landscapes we have here in our great state. 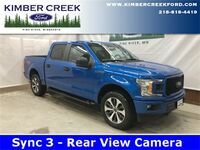 The 2016 Ford F-150 near Brainerd MN may be just the one you’re looking for. The latest version of Ford’s most popular pickup truck is as durable and capable as ever. It is built with a high-strength, aluminum-alloy body which sits on a steel frame. It is the same kind of body used in the aerospace and commercial transportation industries, so you know it is a tried and true method. The idea behind it is to reduce the weight of the vehicle while increasing its strength at the same time. The truck has also been engineered to be even more agile and stable as it carries loads, giving you better peace of mind while driving with a full bed of cargo behind you. Four different engine options are available with the new F-150. The 2.7-liter EcoBoost V6 engine boasts the highest EPA-estimated fuel economy ratings of any gas-powered light-duty pickup truck. The 3.5-liter twin independent variable cam timing (Ti-VCT) engine was designed to handle everyday tasks while keeping its operation costs to a minimum. The 3.5-liter EcoBoost Ti-VCT engine is built to optimize fuel while still providing enough power to handle workloads. Finally, and perhaps most impressively, the 5.0-liter Ti-VCT V8 engine has the available option of Ford’s Compressed Natural Gas/Propane Gaseous Engine Prep Package, which works hard and has lower emissions to help environmental sustainability. Plenty of choices are available. Come on down to Houston Ford and test drive a 2016 Ford F-150 today.